Welcome to Bodie. It’s a rowdy town deep in the Sierra Nevadas, overrun with gold miners, gamblers, and general riffraff, with a dead body every day before breakfast. Into the town rides the Badman, with no name, no memory, no past. Just a draw that makes lightning look slow. As the Badman finds himself taking down villains of all types, he discovers a purpose. But it’s when he visits the angry Paiute tribe, victims of the greedy miners, he learns a terrible curse has been put on Bodie. The way to peace is drenched in blood. And even a bad man has a code of honor. More than a century later the town of Bodie is abandoned. Some say it’s haunted by the ghosts of the town’s inhabitants. But the hills are rich with gold and uranium... will you dare the curse of the Badman from Bodie? A native of Texas, Lariat Quinn lives in the eastern Sierras of California close to the ghost town of Bodie. He served in Viet-Nam with the 101st Airborne Division in 1968-1969. Quinn holds a Bachelor of Fine Arts in Theatre and Speech Communications from Stephen F. Austin University in Nacogdoches, Texas. Active in theatre, he has won several awards in educational theatre, directed community theatre, and acted in many productions. He has performed in bands and as a solo artist. He has written more than 200 songs and has been published by Big Bopper Music and Blueberry Music / United Artist. Quinn has written newsletters, poetry, plays, and radio copy. 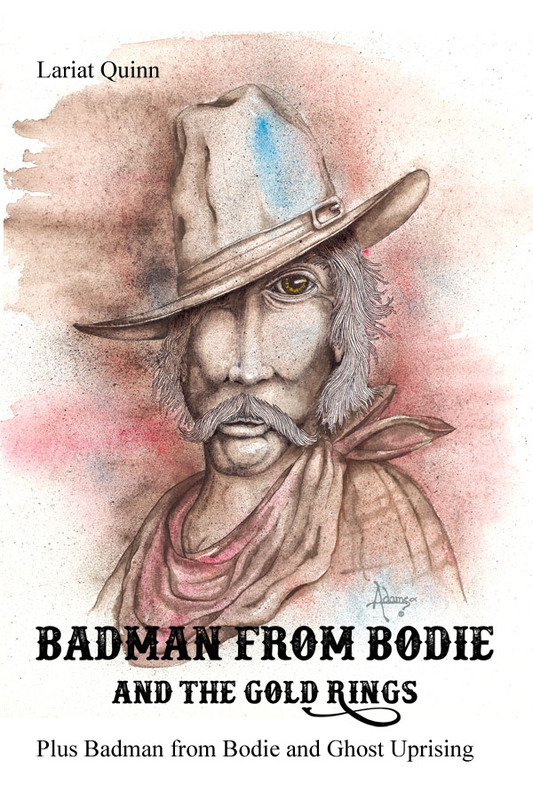 Badman from Bodie and the Gold Rings is his first novel. Quinn is father one of one son, Nova Orion.